Byoung-Joo Kim, left, professor, Seoul National University of Education, and Jihye Han, elementary school arts teacher. Photo by Mayumi Tsutakawa. Seven arts teachers and administrators representing the Korea Arts and Culture Education Service (KACES), a national government agency of South Korea, visited Seattle in mid-March to learn and compare methods of teaching arts in public schools. They came as part of a multi-year partnership with the Washington State Teaching Artist Training Lab (TAT Lab), a program of the Washington State Arts Commission in collaboration with Office of Superintendent of Public Instruction, the National Endowment for the Arts, Seattle Children’s Theatre and Pacific Northwest Ballet. Over the past eight years, more than 200 teaching artists from around Washington state have participated in TAT Lab, which is open to teaching artists working in all artistic disciplines. A number of local API artists, such as the photographer and writer Carina del Rosario, have taken the training and are actively teaching art in public schools. 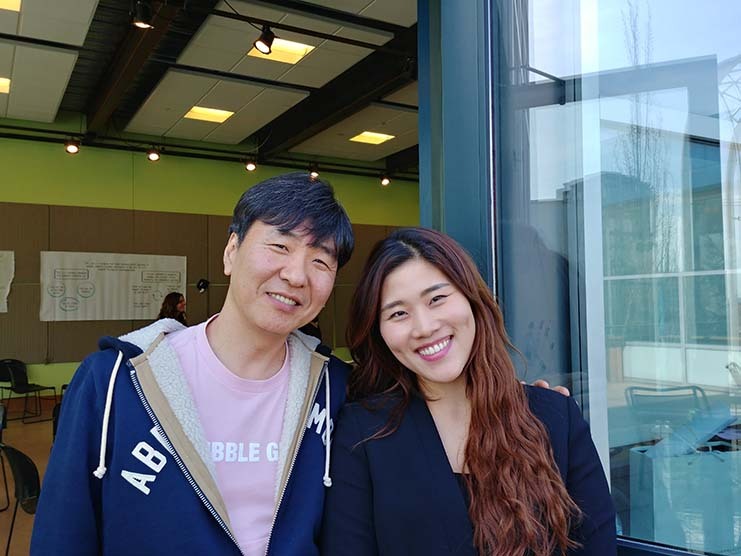 Byoung-Joo Kim, a professor at Seoul National University of Education and program supervisor of KACES, joined the group for three days of training in Seattle. Born in Seoul, South Korea, Kim studied theatre and drama education at New York University before returning to Korea to teach at the college level. Since 2016, when KACES first contacted TAT Lab, members of their staff have come to Seattle twice to observe TAT Lab in action, and TAT Lab instructors have been invited to Seoul twice to teach three- or four-day intensive workshops, explained Lisa Jaret, manager of the Arts in Education program at the Washington State Arts Commission and a co-founder of TAT Lab. But this was the first time that Korean teaching artists came here to participate in the training. “I am an outgoing person and love to meet people,” Han said of her choice of the teaching profession. “I am one of two visiting teachers assigned to my school. I want to inspire the students to be curious. We use games to help them learn to collaborate, then they put on performances.” Han enrolled in the four-day TAT Lab training in Seoul last summer in order to learn new arts-teaching methods. The faculty member Kim said of the Seattle training, “We will take home ideas to develop new techniques to implement lesson plans.” But Kim also admitted that his team is learning to deal with difficult content that could be addressed in their curriculum, such racial differences, and what are politically correct or not correct ways to introduce the topic. Understanding how social justice issues are relevant in K-12 classrooms is an important part of the TAT Lab approach. “We have also discussed how to introduce the Me Too Year for women,” Kim emphasized.